Rafael Ramirez. Venezuela's oil minister between 2002 and 2014. CEO of Petroleos de Venezuela (PDVSA) between 2004 and 2014. During his tenure in PDVSA, the company's turnover was 1,246 trillion USD, as per own figures "audited" by KPMG. 1,246 trillion USD worth of income, in a country of about 30 million people. Ramirez claimed, for the first time ever as far as I am aware, that during his tenure PDVSA handed 480 billion USD to the Venezuelan State. 1,246 - 480 = 766 billion USD. By way of comparison, Ramirez's claim to have handed over 480 billion USD leaves an amount that exceeds the TARP bailout. Venezuela is on the brink of default, nursing around 150 billion USD worth of debt. Venezuela's reserves are under 10 billion USD. PDVSA's oil production is reported to have fallen below 2MPD. Andorra's GDP is 3.2 billion USD. Close associates of Ramirez misappropriated 4.2 billion USD using Banca Privada D'Andorra, in just one deal. PDVSA granted over 30 billion USD in contracts between 2012 and 2015: 20% of that went to non-existing companies, while some of the rest was granted -without bidding- to close associates of Ramirez. New York's Southern District's Attorney's Office has exposed Fidel Ramirez (brother of Ramirez) as bribe recipient in energy related corrupt practices approved by Ramirez. Roberto Rincon, another corrupt businessman associated to Ramirez, was indicted for his participation in a corrupt scheme that cost PDVSA over 1 billion USD. Nervis Villalobos, a trusted lieutenant of Ramirez, sits in a cell in Spain for his participation in bribe payments and procurement corruption associated to PDVSA. Ramirez is also directly involved, through Villalobos, in granting no-bid contracts to Derwick Associates. Diego Salazar (first cousin of Ramirez) was arrested in Venezuela for his participation in a multimillion dollar graft scheme related to PDVSA's insurance policies. Jesus Enrique Luongo (cousin of Ramirez and PDVSA's Refining VP) was arrested when trying to board a plane in Caracas' international airport for his involvement in Salazar's insurance schemes. Balso Sanso (Ramirez's brother in law) was given an extra official role negotiating, on PDVSA's behalf, bidding processes related to Orinoco's oil belt. Wilmer Ruperti, a parvenu businessman involved in shipping schemes with PDVSA, claimed in court documents that Ramirez personally approved his corrupt enterprise. 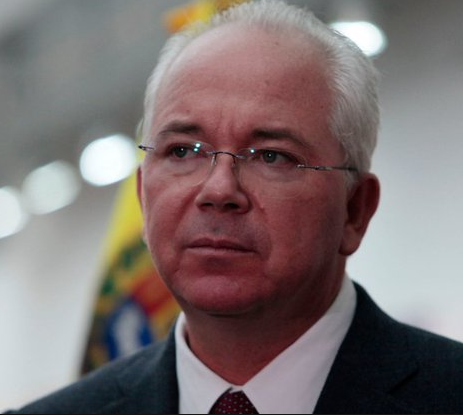 Eudomario Carruyo (former PDVSA's VP of Finance) is involved -as it will be exposed soon- in Salazar's corruption ring centered in Andorra, and was integral in a 500 million USD Ponzi scheme involving PDVSA's workers' pension funds. Ramirez, along with Eulogio del Pino (arrested) and Jose Luis Parada (wanted & on the run), was instrumental in the Aban Pearl / Petro Saudi scandal. The Pantin brothers, recipients of over 1 billion USD worth of no-bid contracts under Ramirez's tenure, acted as facilitators. Ramirez was key in gifting Williams F1 Team over 100 million USD so that Pastor Maldonado could play car racer. It is estimated that Ramirez oversaw transfer of over 20 billion USD in oil shipments, to Cuba and other pariah states in the Caribbean basin, through Petro Caribe. ALBANISA, another scam set up on Ramirez's watch between PDVSA and Nicaragua's Daniel Ortega, amounted to 3.5 billion USD, or some 27% of Nicaragua's GDP as of 2015. The above are just some of the known scandals directly touching Ramirez. As he said recently, PDVSA is "a 234 companies holding" that "grants over 100,000" contracts as a matter of regular practice. His claims to have never been involved in corruption though, amount to little else than flat-earth syndrome. Anyone who's been following Venezuela's monumental graft knows that almost all roads lead to Ramirez. Joint ministerial oversight and executive power of Venezuela's only cash cow leave Ramirez without recourse, or defence. His position is utterly untenable. As all Venezuelan thugs, he is thinking about leveraging vast amounts of incriminating evidence, accumulated and collected over the years, to free himself from impending charges in Venezuela. Be that as it may, there are many close collaborators, who possess untold amounts of equally incriminating material about Ramirez, currently sitting in jails far from chavismo's reach and cooperating with law enforcement.